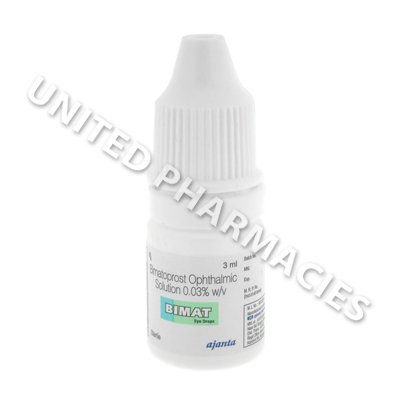 Bimat Eye Drops (Bimatoprost 0.03%) are eye drops given to alleviate intraocular pressure in patients diagnosed with glaucoma. By alleviating the pressure the risks of blindness associated with this condition are significantly reduced. In addition to aiding patients suffering from glaucoma, this product can also be useful for those with hypotrichosis of the eyelashes (eyelashes that are too short), as when it is applied to eyelashes, it can encourage growth and thickening. 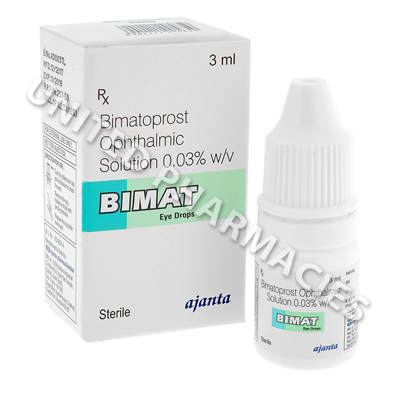 If you wear contact lenses always remove them before applying Bimat Eye Drops (Bimatoprost 0.03%). To apply, hold your eye open and carefully squeeze a few drops into your eye. As soon as you have done this slowly close and reopen you eyes to help spread the liquid over the eye. In order to apply the eye drops to your eye lashes you will need to purchase additional applicators from a pharmacy. To apply, squeeze a one drop of the solution onto the applicator`s tip, then run the applicator along your eyelash. Each applicator should be used for one eyelash only and immediately thrown away after use to avoid contamination. Possible side effects of Bimat Eye Drops (Bimatoprost 0.03%) which are normally mild and relatively safe include eye irritation, burning, stinging, redness, dryness, and watering, as well as increased light sensitivity and discolouration of the iris. If any of these side effects persist, worsen, become bothersome, or become worrying, inform your doctor promptly. If you suffer any of the following, inform your doctor immediately. If you suffer an allergic reaction seek immediate medical attention. Signs of a reaction include rashes, itchiness, swelling, hives, severe dizziness, a tight chest, or trouble breathing. To prevent contamination, do not touch the eye dropper or allow it to touch any other objects. Do not drive or use heavy machinery until you are fully aware of how the solution affects your eyesight after use. This drug may cause temporarily impaired vision. Before you use Bimat Eye Drops (Bimatoprost 0.03%) always inform your doctor if you are pregnant or breastfeeding, and always disclose details of any allergies you have, any other medical conditions you have or have had (particularly eye related conditions), as well as details of any medication which you are taking (including all off-the-shelf meds, vitamins, supplements, and use of any recreational drugs).